Éric Serge Gagné (French pronunciation: ​[ɡɑɲe]) (born January 7, 1976) is a Canadian former professional baseball pitcher. 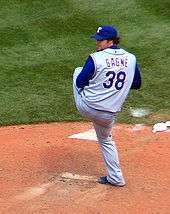 Signing with the Los Angeles Dodgers of Major League Baseball as a free agent in 1995, Gagné began his career as a starting pitcher. After he struggled in that role, the Dodgers converted Gagné from a starter to a reliever, where for three years (2002–2004) he was statistically the most outstanding closer in the game, winning the Cy Young Award in 2003. During that period, he set a major league record by converting 84 consecutive save opportunities. The phrase "Game Over" was heavily used by the Dodgers and the media in connection with his appearances to finish close games. Gagné, from a Québécois family, grew up in the small town of Mascouche, near Montreal, Quebec. As a boy, he played baseball and ice hockey at Montreal's Polyvalente Édouard-Montpetit High School, the same high school that Russell Martin attended. At the start of the 2002 season, following the retirement of Dodgers closer Jeff Shaw, he was converted from a starting pitcher to a relief pitcher. He picked up his first career save on April 7 against the Colorado Rockies and soon became the National League's leading reliever. He saved 10 consecutive games before he suffered his first blown save on May 7 against the Atlanta Braves. Overall, he earned 52 saves for the season. In addition to his 55 saves, Gagné finished the 2003 season with a 1.20 earned run average and had 137 strikeouts and 20 walks in 82⅓ innings pitched. This translated into 1.66 strikeouts per inning pitched. For his performance, he won the Rolaids Relief Man of the Year Award and became the first relief pitcher in 11 years to win the Cy Young Award. He and Ferguson Jenkins are the only two Canadian pitchers to win the most prestigious pitching award in baseball. He is the only pitcher to win the award while having a losing season (his record was 2–3). Despite this, he lost his arbitration case over the winter; he had asked for a 14-fold raise from $550,000 to $8 million but had to settle for $5 million. 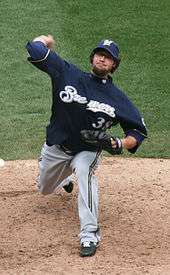 On December 9, 2007, Gagné reached a preliminary agreement with the Milwaukee Brewers. On December 10, he inked the one-year deal to become their new closer. The one-year deal had a base salary of $10 million, with incentives worth up to an extra $1 million. On May 11, Brewers manager Ned Yost announced Gagné would be removed from the closer's role for a while, after 3 blown saves in 6 attempts. But after a couple days Gagné said he was ready to go, and a couple days later got his 10th save. However, Gagné continued to struggle as the team's closer and ultimately became the set-up man after losing his closer job to the veteran Salomón Torres. Gagné's struggles continued out of the bullpen, however. He eventually lost his set-up job to Guillermo Mota, and he finished the season as a middle relief pitcher, a role in which he still struggled. Gagné became a free agent following the 2008 season and re-signed with the Brewers to a minor league deal. However, he was released midway through spring training in part due to a shoulder injury. On February 18, 2010, Gagné agreed to a minor league contract with the Los Angeles Dodgers with an invite to spring training. Dodgers reliever Ramón Troncoso, remembering Gagné's mentorship of young pitchers such as himself during Gagné's earlier stint with the Dodgers, "had no problem" releasing to Gagné his old uniform number 38. Gagné made three Spring training appearances with the Dodgers, allowing six runs on eight hits in 2⅔ innings for a 20.25 ERA. On March 15, he was reassigned to minor league camp, acknowledging that he needed more work to bring his game back to the Major League level. However, after appearing in just one Minor League intrasquad game after his demotion, Gagné asked and was granted his release, on March 21, from the Dodgers, with the hope that he could find another opportunity with another team. However, he announced his retirement on April 18. In the fall of 2013, Gagné was named the head coach of the French national baseball team. The team finished in sixth place in the 2014 European Championships under Gagne. France will compete in the 2016 World Baseball Classic Qualifiers in Panama. On August 28, 2015, six years after his last presence in professional baseball, Gagné participated in a game with the Trois-Rivières Aigles of the independent Can-Am League as a starting pitcher. Gagné recorded 2 strikeouts in 4-1/3 innings, allowing only 1 run and two hits but gave up 5 walks to the opposite team, the Quebec Capitales, in a 5-3 win for the Aigles. Gagné and his ex-wife Valerie (née Hervieux) have four children, two daughters, Faye (born 2000) and Bluu (born 2005), and two sons, Maddox (born 2004) and Harley (born 2008). His father's cousin, Paul Gagné, played several seasons in the NHL. ↑ "Single-Season Leaders & Records for Saves - Baseball-Reference.com". Retrieved October 18, 2016. 1 2 ""Canadian Little League Graduate Éric Gagné Wins NL Cy Young Award"". Little League Online. November 13, 2003. Archived from the original on April 16, 2007. Retrieved October 20, 2007. 1 2 3 Ken Gurnick, "Batting Around with Éric Gagné", Baseball Canada, May 14, 2002. ↑ "Éric Gagné", JockBio.com, 2003. 1 2 3 4 Shaikin, Bill (July 5, 2009). "Game (not) over for former Dodger Eric Gagne". Los Angeles Times. Retrieved July 6, 2008. 1 2 3 4 5 Habib, Daniel G. As Scary As He Looks, Sports Illustrated. Published June 2, 2003. Retrieved May 29, 2010. 1 2 "Gagne gets comfortable on mound, not trying to throw hard". ESPN. Associated Press. February 22, 2007. Retrieved July 3, 2007. ↑ "Gagne agrees to $6M deal with Rangers". ESPN. Associated Press. December 12, 2006. Retrieved July 1, 2007. ↑ "Dodgers take Gagné deep", Associated Press, February 19, 2004. ↑ "Gagne to Have Surgery, Done for Season". MLB. July 7, 2006. Retrieved December 18, 2006. 1 2 "Red Sox Gets Gagne". Yahoo. July 31, 2007. Retrieved July 31, 2007. ↑ "Gagne to start on DL to get more work". ESPN. Associated Press. March 31, 2007. Retrieved July 1, 2007. ↑ "Gagne tosses in straight days for first time in 2 years fffff". ESPN. Associated Press. April 7, 2007. Retrieved July 1, 2007. ↑ "Rangers activate Gagne, put starter Wright on DL". ESPN. Associated Press. April 13, 2007. Retrieved July 1, 2007. ↑ "Rangers place Gagne on 15-day DL". ESPN. Associated Press. April 23, 2007. Retrieved July 1, 2007. ↑ "Gagne returns to Rangers after stint on disabled list". ESPN. Associated Press. May 8, 2007. Retrieved July 1, 2007. 1 2 Jerry Beach, "Another Gag Job", scout.com, September 19, 2007. ↑ "Gagne, Brewers finalize $10M, 1-year deal". Fox Sports. December 10, 2007. Retrieved December 10, 2007. ↑ "CANOE -- SLAM! Sports - Baseball - Canada: Gagne signs with Can-Am team". Retrieved October 18, 2016. ↑ Hernandez, Dylan (February 22, 2010). "Dodgers Spring Training Report". Los Angeles Times. Retrieved February 22, 2010. ↑ "Eric Gagne sent back to minors; Joe Torre says Ronald Belisario unlikely to be on opening day roster". March 15, 2010. Retrieved October 18, 2016. ↑ "404". Retrieved October 18, 2016. 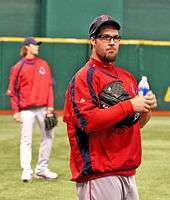 ↑ "Eric Gagne enjoying being pitching coach for France | MLB.com: News". Mlb.mlb.com. Retrieved July 13, 2016. ↑ "Former Cy Young winner Eric Gagne signs with the Ottawa Champions". August 22, 2016. Retrieved October 18, 2016. ↑ "Champions looking to live up to their name in Can-Am playoff start". Retrieved October 18, 2016. ↑ "Mitchell Report" (PDF). p. 2. Retrieved December 13, 2007. 1 2 "Brooks Baseball · Home of the PitchFX Tool — Player Card: Eric Gagne". Brooks Baseball. Retrieved August 15, 2012. ↑ James, Bill; Neyer, Rob (June 15, 2004). The Neyer/James Guide to Pitchers: An Historical Compendium of Pitching, Pitchers, and Pitches. Simon and Schuster. p. 214. ISBN 9780743261586. Retrieved August 15, 2012. ↑ Donovan, John (August 6, 2003). "Case closed: Smoltz, Gagne, Wagner may be best trio of closers ever". Sports Illustrated.com. Retrieved August 15, 2012. ↑ Schlueter, Roger (August 3, 2012). "MLB Notebook: Chapman pitches for strikeouts". MLB.com. Retrieved August 15, 2012. ↑ "Major League Leaderboards » 2012 » Pitchers » Plate Discipline Statistics". Fangraphs. Retrieved August 15, 2012. ↑ "Eric Gagné Biography". MLB. Retrieved May 2, 2008.